20% OFF Holiday Gift Cards! Read the information below for details regarding our Holiday Gift Card Sale and Special Offers! Redeem 20% OFF Holiday Gift Cards starting December 26, 2018. Discounted Gift Cards may not be redeemed for cash, gratuity, or to purchase any other Gift Cards. Buy gift cards November 1 through Christmas Eve, December 24. We will be closed on THANKSGIVING DAY and CHRISTMAS DAY. Buy gift cards November 1 through Christmas Day, December 25. Order by DECEMBER 15! We CANNOT guarantee delivery of Gift Cards by Mail before Christmas (12/25) if ordered after December 15. CLICK HERE for full-priced Gift Cards that can be redeemed immediately. E-Gift Cards are e-mailed to the inbox of your choice (yours or a recipient’s) instantly and are a great option for those last minute gifts that you need right away! Sorry, full-priced e-gift cards are not available during our Holiday sale. CLICK HERE to read all of our Gift Card Policies. 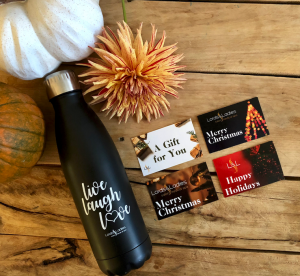 For every $200 value Holiday Gift Card purchased, receive a FREE L&L Limited Edition Aluminum Water Bottle! Buy one in-salon for $10 with ANY Holiday Gift Card purchase. Sorry, not valid with E-Gift Card purchases.